Update 2017: A virtual toll free number is a 1-800 number combined with a virtual PBX phone system that makes it easy for small businesses to run their business from anywhere on any phone or device. Virtual toll free numbers are enhanced with virtual phone system features allowing them to route calls to multiple phones, virtual extensions, or virtual voicemail boxes. Virtual extensions can forward to any phone (home, office, cell, landline. VoIP, smartphone app etc.) or a virtual voicemail box. Virtual voicemail boxes are managed online or via your smartphone app forward voicemail messages right to your email inbox. Having a virtual toll free number allows your small business to have all the power of a Fortune 500 company phone system without the cost or equipment needs associated with traditional on-premise PBX business telephone systems. One virtual 800 number connects your whole business. When customers call your business 1800 number they are greeted and routed to the proper phone, extension or voicemail. You can stay connected and sound professional with a virtual toll free number powered by UniTel Voice’s virtual office phone system. 1. 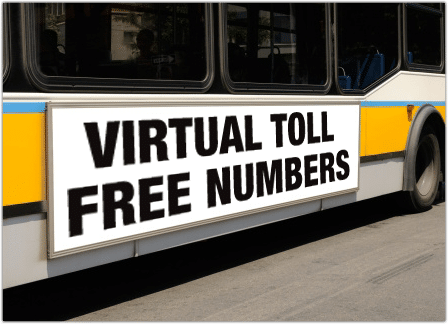 What are virtual toll free numbers? Virtual toll free numbers are business phone numbers (with the following area codes: 800, 888, 877, 866, 855, 844, and 833) that are hosted online (otherwise known as cloud-based). They’re great for startups and small businesses because they are fast and easy to set up and super cost-effective (especially with UniTel Voice). Call quality is not an issue – unless you are call forwarding to a cell phone that is getting poor reception or a VoIP phone with slow internet. UniTel Voice’s virtual toll free and local numbers can call forward to any type of phone (landline or VoIP or Cellular). 2. How does a virtual toll free number work? Virtual toll free number service means small businesses can buy 1800 number service that work like a professional hosted PBX VoIP telephone systems for small business. Calls are greeted by a customizable auto-receptionist or auto attendant and routed to the proper department or employee extension. Calls can forward to any phone, your office, your home phone or even your cell phone. In fact, having a virtual toll free number allows you to run your business from your cell phone while sounding like a Fortune 500 company. 3. Why should my small business get a virtual 800 number? A virtual toll free number can help your small business, home-based business, or startup business sound more professional and stay connected. Having an 800 number gives your business instant credibility, and with a virtual toll free number your business will sound as if it has an expensive professional business telephone system. These services are more affordable than ever before. Virtual toll free number phone systems come loaded with easy-to-use PBX features that work with your existing phones. You can basically run your business from your cell phone – there’s no complex software or hardware to manage.